What happens when you turn off iClud Photo Library? 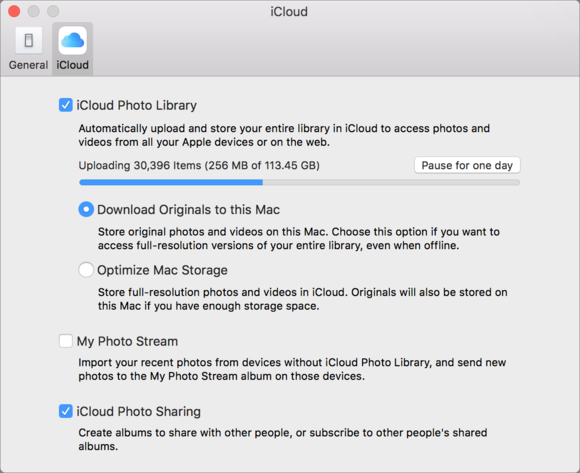 Erin Giunta is ready to give iCloud Photo Library the heave-ho, but wants to be sure their photos aren’t lost. I’m confused about what would happen if I turn off iCloud Photo Library on my phone, and not use it on the Cloud. Will my Photos app on the computer still retain all 12,000 of my photos? Do these photos live locally on my hard drive? It depends! And macOS should prompt you in case you make a decision that would result in you losing images somehow. If you’re already storing the full-resolution versions of everything on your Mac, you don’t have to take any additional steps. In Photos for macOS, select Photos > Preferences and click the iCloud icon. If iCloud Photo Library is checked and Download Originals to This Mac is selected, all your synced images across all linked accounts will be on the Mac. The iCloud preference pane in Photos lets you confirm whether you’re storing full-resolution images or not and the status of your library sync. If, however, you had selected Optimize Mac Store, you have to change your setting to Download Originals to This Mac and wait for the operation to complete. You can find sync status at the very bottom of the main Photos view in the Photos app in macOS, too. When you’re sure you’re fully synced, uncheck the iCloud Photo Library box in preferences, and you’re “severed.” This should retain all these images in iCloud Photo Library (via iCloud.com and your linked iOS devices) until or unless you delete everything in one or more of those locations.